A quick post! Today is Dave's birthday. He bought a chocolate cake with pink vanilla icing w/ sprinkles - I guess they were out of white vanilla? The cakes were baking while I was putting away some Halloween stuff so when it came time to decorate the cake I decided to use a skeleton which seemed especially fitting since Dave was "holy cowing" the idea of being 44! 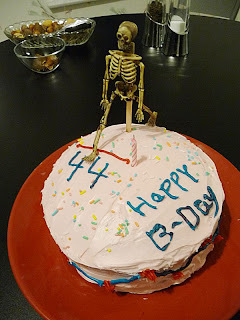 So a theme cake of a skeleton crossing the "finish line" and beginning age 44 seemed appropriate since Dave is also a big time runner. Katie says the cake is a little disturbing especially with the pink icing. I do like making "themed" cakes though!